Trucks body is made of super-soft velboa and coruroy accents, shiny tricot bumpers and souped up with embroidered details including door handles, hub caps, eyes and red tail lights. When you press it's roof it goes BEEP!�BEEP!�BEEP! Plush toy is 8.5" long. It's the most wonderful time of the year! 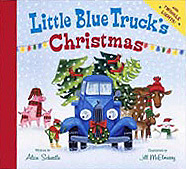 Little Blue Truck is spreading cheer by delivering Christmas trees to his animal friends. Can you help count each green tree from one to five and back again? Donxt forget to save one for Blue! Beep! Beep! Flashing colored Christmas lights on the final page are an added treat. Board Book with Twinkle Lights. Ages 2 - 4. 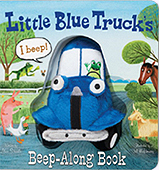 With this new take on the classic sing-along song, kids can interact with their favorite Little Blue Truck and beep his horn while they visit with all his farm animal friends. Colorful illustrations, bouncy rhyme, and a cuddly truck with built-in squeaker make this a perfect interactive choice for play time and story time. Board Book. Ages 2 - 4. 8Zooom! Wooeeee . . . ! "Make way!" The big city sure is a speedy, noisy place for a country truck like Blue. Everywhere Blue looks, he sees buses, police cars, taxis, vans, a street sweeper, and even the mayor's limousine. With everyone pushing to be first, soon there's a giant traffic jam! 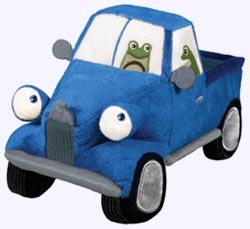 But even a wrangle-tangle is no match for Little Blue Truck, who comes to the rescue in true Blue style. Includes fre downloadable party kit! Board Book. Ages 2 - 4. 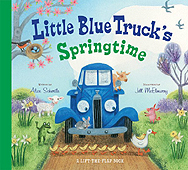 Celebrate the beauty of springtime with Little Blue Truck! Young fans will love finding all sorts of baby animals beneath the flaps in this delightful novelty board book. Beep! Beep! Peep! Board Book. Ages 2 - 4. Beep! Beep! Beep! Meet Blue. A muddy country road is no match for this little pick up--that is, until he gets stuck while pushing a dump truck out of the muck. Luckily, Blue has made a pack of farm animal friends along his route. And they're willing to do whatever it takes to get their pal back on the road. Board Book. Ages 2 - 4.